Monk goes to graph city to learn about graphs, and meets an undirected graph having \$ N \$ nodes, where each node has a value \$ i \$ such that \$ 1 \le i \le N \$. Each node of the graph is very curious and wants to know something about the nodes which are directly connected to it. For each node, if we sort the nodes directly connected to it, according to their values in descending order, what is the value of the node at the \$ k \$ th position? The graph is 1-based. 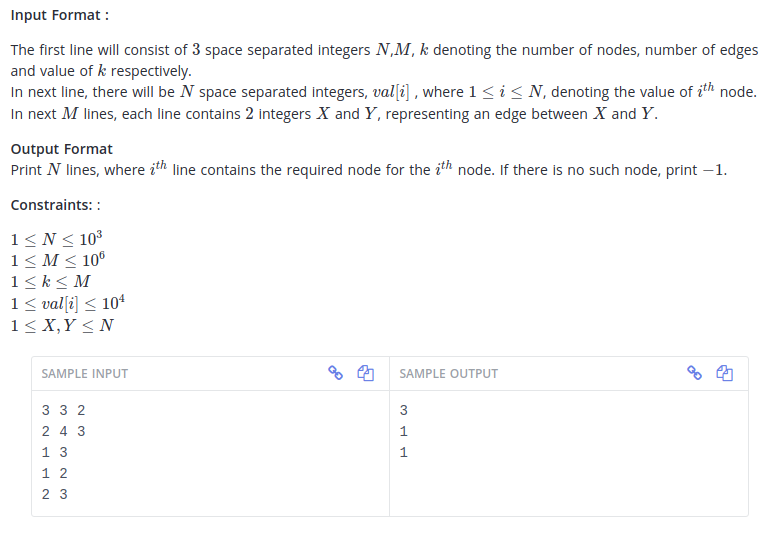 Note: If two nodes have the same value, they are sorted according to their indices in ascending order. With a runtime of 9.14092 sec. How can I improve the code quality and further optimize runtime duration? In case of equal values, I need to sort the nodes according to their indices in ascending order. Currently I'm doing it by looping over the sorted list and then comparing values again side by side maintaining two pointers. Can you please suggest some elegant way of doing this. As for runtime duration, there is not really much you can do, as the algorithm is already optimum. As for the sorting, note that you can make the key a pair instead of only 1 value and it will sort first by first value, and if equal it sorts according to second value. On a side note, if you run the same code as python 2.7.6 instead of 3.5.2, it´s about 2s faster. Not the answer you're looking for? Browse other questions tagged python performance programming-challenge python-3.x graph or ask your own question. Can someone help me optimize my DFS implementation in Python?